This article first appeared in the Big Rapids Pioneer in March 2010 to celebrate National Women's History Month. Women have always been writing, even before our nation was created, but it is only until now that one woman has endeavored to chronicle the history of women writers--essayists, novelists, playwrights, poets, and more--in America. 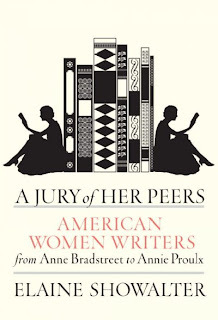 A Jury of Her Peers: American Women Writers from Anne Bradstreet to Annie Proulx , written by Elaine Showalter, a professor emerita at Princeton University, is the the first book of its kind. Its title is aptly taken from the short story by early twentieth century writer Susan Glaspell, about two women who conceal evidence of another woman's crime, appointing themselves a jury of her peers, and protecting her from "the patriarchal system of the Law." The theme of judgment throughout this book is present, but not overpowering. A Jury of Her Peers is quite readable and fascinating as Showalter explores not only the works, but also the lives, of the many women who have in some way taken part in shaping our culture and our country, and how they are all interrelated. Showalter's canon is expansive and diverse, and she writes as much about the lesser-known women as much as she does of Dickinson, Cather, Alcott, and the like. In fact, it is her insights on those names not often heard that make the book most fascinating, and some of the best essays are about Susanna Rowson and Julia Ward Howe. Though, as the title implies, the book is focused on writers, Showalter's work touches upon a broad range of subjects: literature, performing arts, political activism, and the mundane tasks of every day life. This is an excellent, powerful, and well-researched source for knowledge and insight on how woman through the ages have lived. It is thought-provoking and will leave you with a long list of books to read and a strong urge to visit the library. But despite being a celebration of women writers, and one would even argue, women's history, perhaps the best part about A Jury of Her Peers is that she illustrates through her many biographies, excerpts, and anecdotes that despite the fact that society views these individuals first as women and not writers, solely being a woman is not what makes these writers or their works so great. Showalter gives the hundreds of women she writes about what many of them searched for but could not accomplish: a voice of their own and the recognition they deserve for playing such an integral role in our history.